The durability of concrete is known from the building construction. 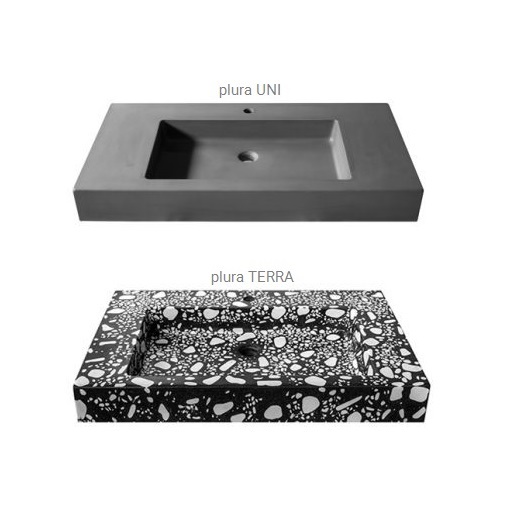 However the untreated concrete is not sufficient to construct a functional washbasin. Concrete is porous, so it absorbs and smudges easily. So, in order to be waterproof and protected from unwanted stains, is necessary the treatment and the sealing of the surface. The waterproofing system which we apply over the surface, consisting of specific varnishes in four stages, and achieves the best result while also does not affect the natural appearance and the texture of concrete. Terrazzo mosaic is another option for concrete finish: the well-known polished surface, impregnated with penetrating fluid which protects against staining. Terrazzo mosaic is also available in a combination of many colors and aggregates. 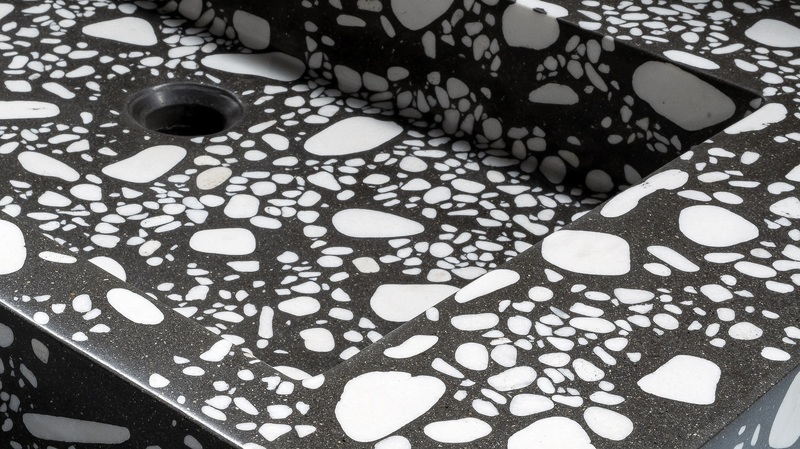 Although originating in the old days, Terrazzo mosaic is classified by modern architecture and design experts as a modern floor and wall coating material. With the advent of technology, Terrazzo mosaic has evolved by expanding to a wider variety of colors that practically know no boundaries. Additionally, the industry has searched for and produced protective fluids and cleaning agents that reinforce its durability so its beauty can remain intact. Terrazzo mosaic does not deteriorate and does not need to be maintained every few years. Its properties and beauty resemble those of marble and granite, only to a lower price. It can be easily cleaned due to its very smooth and polished surface. This also renders it ideal for spaces where top hygiene conditions are required. The Plura washbasin, its name chosen to convey the concepts of plurality and diversity, can be adjusted to the dimensions that will satisfy your demands, with a lower cost of production. 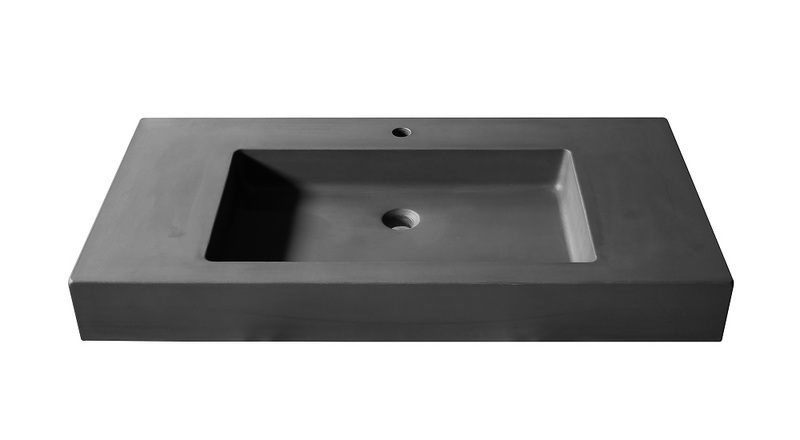 Manufacturing a washbasin with special dimensions out of concrete is indeed a far more expensive procedure than the massive production process of a washbasin with fixed dimensions. Indeed, a special product like this requires the creation of both an original product and a mold, before the final product can be manufactured. Therefore, in order to make products at a lower cost, we created multiform molds that can be adjusted to your desired dimensions. The sink, i.e. the concave part of the Plura washbasin, has fixed dimensions. The shape of the sink can be rectangular, round or oval, and it can be mounted on any part of the countertop, in its center or on its edge. Their dimensions, however, are fixed and cannot be changed. 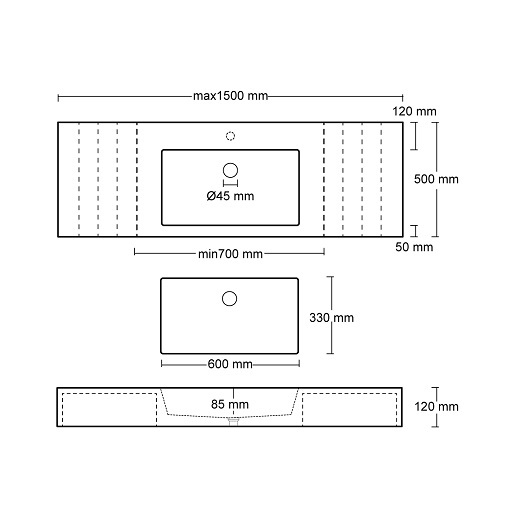 The external dimensions of the Plura washbasin can vary, with a length of 70 to 150 cm, a width of 43 to 50 cm and a fixed height of 12 cm. The Plura washbasin can be mounted on furniture and on the wall (using a special mounting kit), with or without a faucet hole on the counter. The Plura washbasin is available in the 6 standard colors of our collection, while more colors can also be made available. An alternative to these is the terrazzo finish, featuring various colors of concrete and white chips.